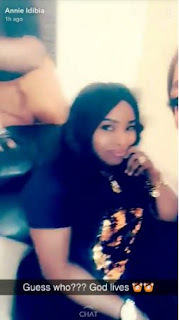 Home Unlabelled Actor, Halima Abubakar FINALLY RECOVERED From Fibroid. Actor, Halima Abubakar FINALLY RECOVERED From Fibroid. This is good news coming from Nollywood as actor, Halima Abubakar who spent the last few months treating complications from her fibrosis operation has been pictured on a movie set with Annie Idibia completely rejuvenated.